In honor of St. Patrick’s Day, we selected a liqueur that is made in Ireland, conjures up Irish history and adds a modern twist to an Irish classic. Irish Mist is linked with the history of Ireland, itself. In ancient Ireland, the Chieftains, nobles and warriors drank a wine made of honey and herbs. With the English conquer of Ireland in the 1500’s and the fleeing of the Irish nobility and soldiers in the 1600’s, the recipe seemed to disappear and was lost. According to lore, the recipe was lost until Desmond Williams of the Tullamore Distillery came across a manuscript containing the recipe that magically appeared in the 1940’s. Mr. Williams took this recipe and adopted it, using Irish Whiskey at it’s base. The Irish Mist is a nice combination of Irish Whiskey and honey. The liqueur retains the soft, round, easy quality of the Irish Whiskey and adds a honey and herbal component but manages to not make the honey cloying. If you are a fan of Irish Whiskey, chances are pretty good that you will also like this liqueur. Try it on the rocks, in your coffee or with cola for a different twist. Appearance: Clean with a medium copper to amber color and viscous legs. Aroma: Clean with medium, matured aroma characteristics of dried apricots, raisins, dried figs, orange peel, honey, cinnamon, clove, wildflowers and herbs. Palate: Medium sweet, medium body, medium plus intensity of dried apricots, raisins, dried figs, orange peel, honey, cinnamon, clove, wildflowers and herbs. Medium plus, clean and balanced finish. Rating: Good liqueur. The Irish Mist had a touch of Irish whisky on the nose and palate but with more of a dried character plus the honey, wildflower, baking spices and herb flavors of the infusion. 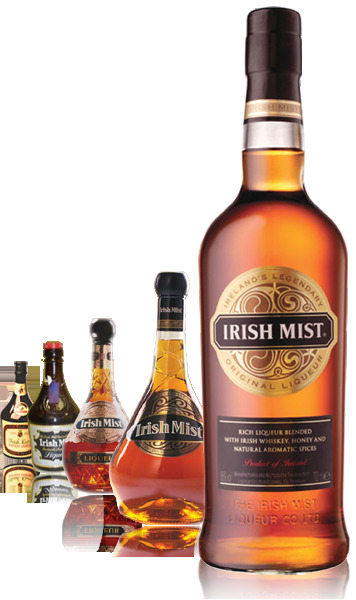 The Irish Mist was not overly sweet and the body of the liqueur had a nice texture without being cloying.